This post is about all 3 technologies, the pioneers that led to where we are today with these technologies, where we “are” today with these technologies; along with some correlations to one of my other favorite technologies, Augmented Reality. The most inspiring and persistent AI revolutionaries is a gentleman by the name of Yann LeCun. Initially ridiculed for researching topics that mimic certain features of the brain with the thought that by doing so, he could discover ways that led to intelligent machines, you’ll see by reading this entire post he’s still a main thought leader in this discipline today. He ignored obstacles and stayed steadfast in his theories. You can read about his research here. Despite the ridicule, in the mid-90’s while at Bell Labs (then owned by AT&T) LeCun created software that simulated neurons and learned to read handwritten text by looking at many different examples. AT&T used it to sell the first machines capable of reading the handwriting on checks and written forms. The bank machines could read thousands of checks per hour! How he accomplished this is documented by the IEEE here; a fascinating read! Quite unbelievably, notwithstanding this huge success – literally the same day this huge breakthrough was announced – AT&T split into 3 companies dedicated to different markets, and LeCun was directed to work on other things. Unfortunately his brain-inspired approach to AI fizzled out. Almost 2 decades later, LeCun’s ideas have come full circle. The brain-inspired approach to AI, now called “Deep Learning“, is back and being used by top technology companies making great strides in facial and speech recognition today. 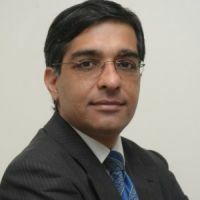 There are other pioneers who led innovations of the deep learning technique. 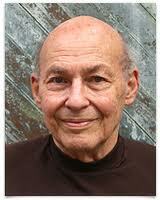 One such pioneer was psychologist Frank Rosenblatt back in the 1950’s. Biologists then were developing mathematical theories of how intelligence and learning emerge from signals passing between neurons in the brain. 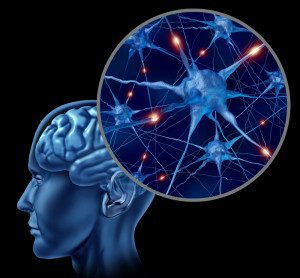 The idea – still current today – was that the links between neurons are stronger if those cells communicated frequently. The bombardment of neural activity triggered by a new experience adjusts the brain’s connections so it can better understand the experience the second time around. 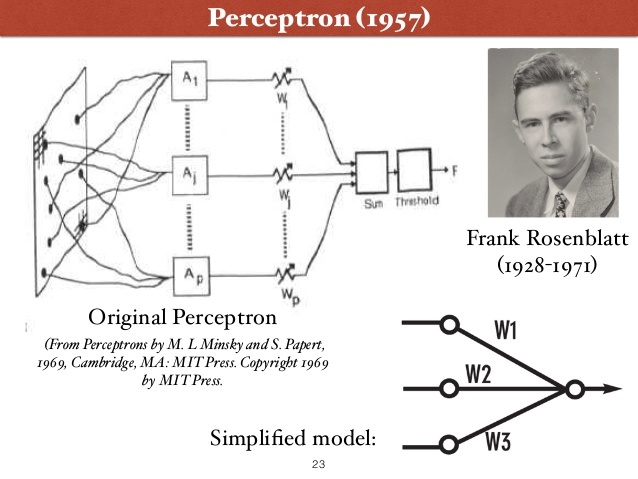 In 1956, Rosenblatt used those theories to invent a way of making simple simulations of neurons in software and hardware, announced by the New York Times article ‘”Electronic ‘Brain’ Teaches Itself.” Rosenblatt’s design, which he called “Perceptron“, could learn how to sort simple images into categories such as triangles and squares. This was implemented on giant machines thickly tangled with wires, but they established the basic principles at work in artificial neural networks today. 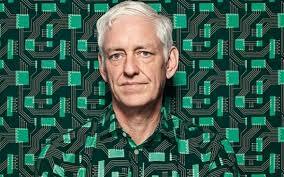 The computer he built had 8 simulated neurons made from motors and dials connected to 400 light detectors. Each of the neurons received a share of the light signals, combined them, and depending on what they added up to, produced either a “1” or a “0”; together those digits was the perceptron’s description of what it saw. 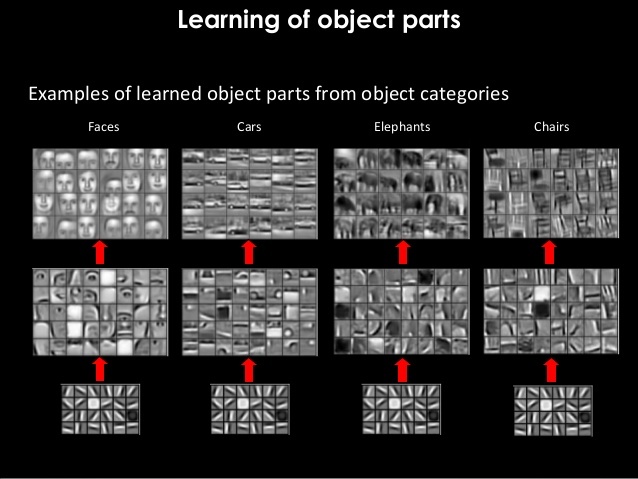 Initially this failed, but with using a method called supervised learning, he was able to train a perceptron to correctly distinguish different shapes. He’d show the perceptron an image along with the correct answer. Then the machine would tweak how much attention each neuron paid to the incoming signals, shifting “weights” toward settings that would produce the right answer. Eventually the perceptron could correctly categorize images it had never seen before. Today’s deep learning networks use very sophisticated algorithms and have millions of simulated neurons, with billions of connections between them. However, they are trained the same way Rosenblatt trained his perceptron. 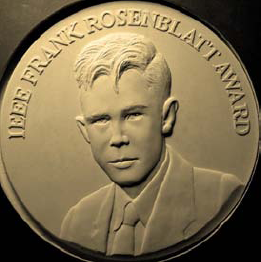 In 2004, the IEEE Frank Rosenblatt Award was established. 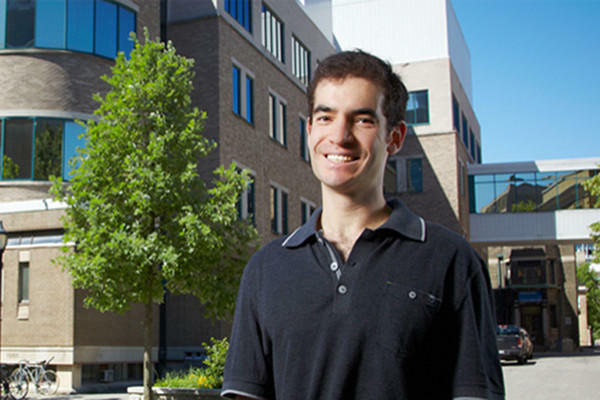 Rosenblatt is regarded as one of the founders of neural networks. The award is presented to people or groups for outstanding contribution(s) to the advancement of design, techniques, or theory in biology and linguistically motivated computational paradigms, including but not limited to neural networks, connectionist systems, evolutionary computation, fuzzy systems, and hybrid intelligent systems in which these paradigms are contained. Rosenblatt predicted that perceptrons would one day be capable of doing things such as greeting people by name; this idea became a linchpin of the nascent field of artificial intelligence. 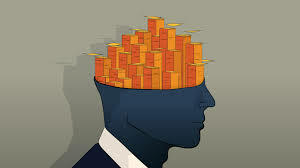 Research was done on perceptrons with more complex networks arranged in a hierarchy of multiple learning layers. The idea was, by passing images or other data successively through layers would allow a perceptron to solve more complex problems. Unfortunately, his learning algorithm couldn’t work on multiple layers. 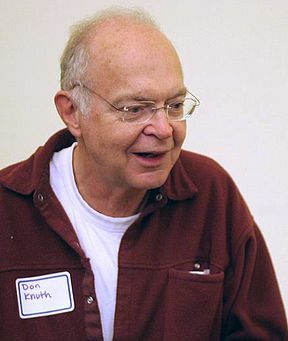 In 1969, AI pioneer Marvin Minsky published a critique of perceptrons, claiming getting more layers working wouldn’t make perceptrons powerful enough to be useful. With that one publication, interest in neural networks was again halted. In the early 1980’s, LeCun was astounded that Rosenblatt’s perceptron theory was abandoned. This led him to a group of underground researchers working on Rosenblatt’s idea of working with neural networks with multiple layers. 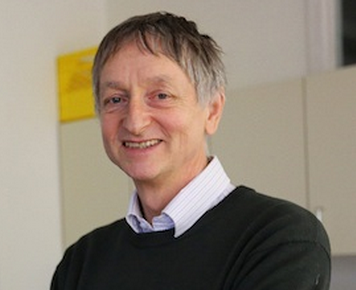 It’s central figure was Geoff Hinton (who now works at Google and the University of Toronto.) LeCun and Hinton became mutual admirers and LeCun joined the underground movement in 1985. 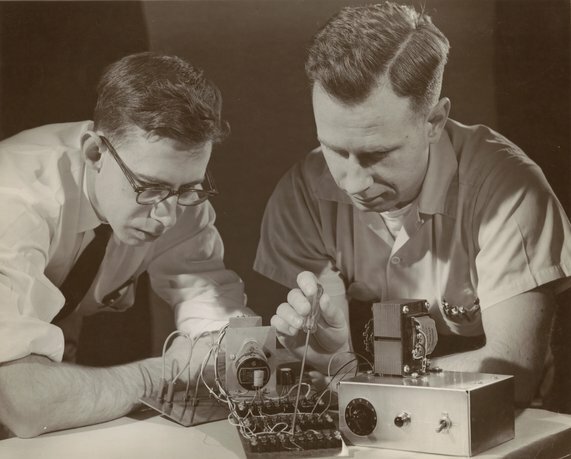 After LeCun’s check-reading project ended, backpropagation proved tricky to adapt to other problems, and a new way to train software to sort data was invented by a Bell Labs researcher which didn’t involve simulated neurons and thus was seen as mathematically more elegant. It quickly became a cornerstone of Internet companies such as Google, Amazon, and LinkedIn that used it to train systems to block spam or suggest to you things to buy. 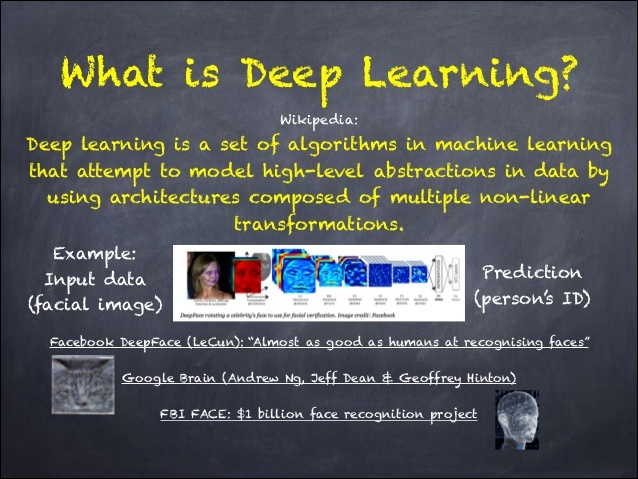 In 2003 LeCun, Hinton and a new collaborator University of Montreal professor Yoshua Bengio formed what LeCun calls “the deep-learning conspiracy“. 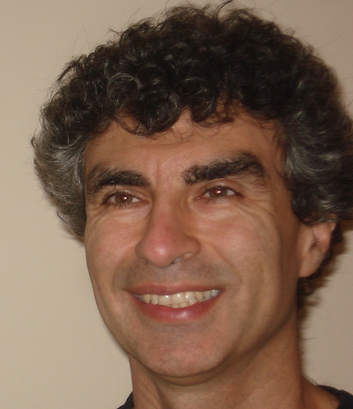 Yoshua Bengio, Google Scholar, Most Noted for His Work on Artificial Neural Networks. 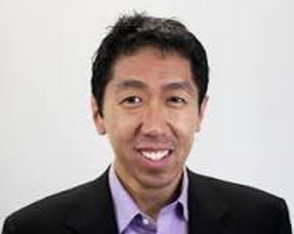 He is Noted for His Work in Deep Learning, Along with Yann LeCun, Geoffrey Hinton, Andrew Ng et al. In order to prove that neural networks are useful, they quietly developed ways to make them bigger, train them with larger data sets, and run them on more powerful computers. In contrast to LeCun’s 5 layers of neurons in his handwriting recognition system, they now could have 10 or many more. Approximately in 2010, “deep learning” started to beat established techniques on real-world tasks like sorting images. 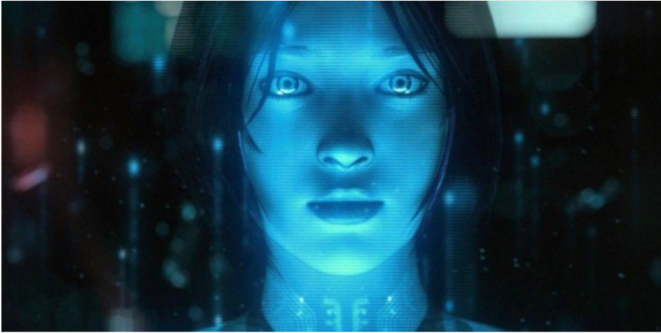 Microsoft, Google, and IBM added it to their speech recognition systems. 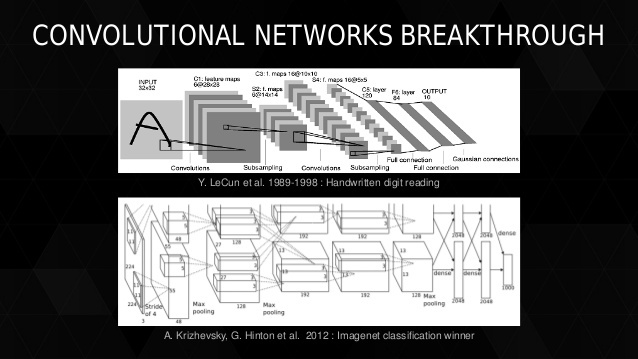 Regardless, neural networks were still not considered widely useful. In 2012 LeCun’s rejection from a major conference on setting a new record on a standard vision task incensed LeCun. Read below to discover who was accepted into that competition and won. 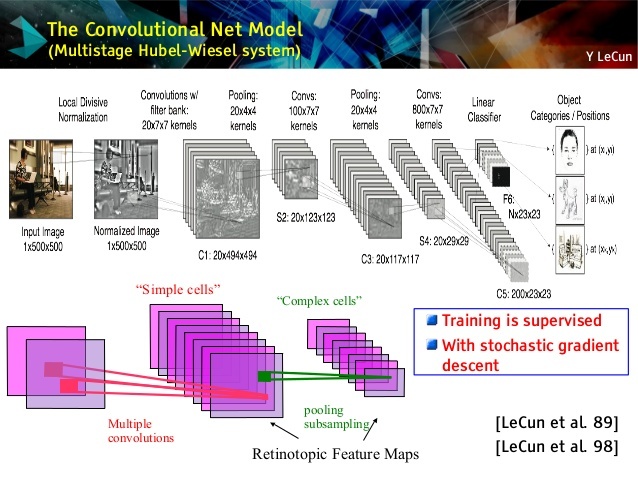 For the first time, LeCun saw the very people who ignored neural networks be absolutely amazed. They finally “got it.” Academics working on computer vision abandoned their old methods and deep learning suddenly became one of the main strands in AI. Google bought a company founded by Hinton and the 2 students behind the 2012 result, and they started working on a research team known as “Google Brain“. 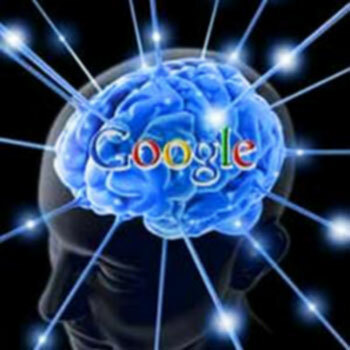 Here’s a very in-depth article on what Google Brain is and what “brains” are behind that brain 🙂 http://bit.ly/GoogleBrainInDepth. LeCun harbors mixed feelings about the 2012 research that brought the world around to his point of view. He should have been credited with the breakthrough system, and even Hinton (credited for the breakthrough) agrees that LeCun’s group had done more work than anyone else to prove out the techniques used to win the ImageNet challenge. The only reason he didn’t enter the challenge was a conflict with graduation schedules and other commitments. 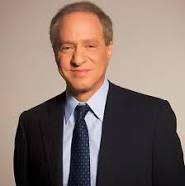 Another amazing person is Ray Kurzweil, the Panglossian (definition: “characterized by or given to extreme optimism, especially in the face of unrelieved hardship or adversity“) philosopher of AI. 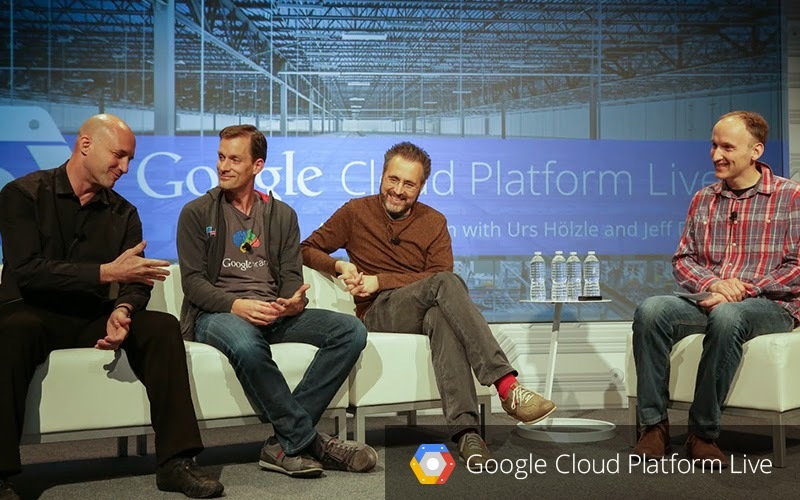 And here he is in a panel of experts with Jeff Dean is wearing the “Google Brain TShirt” – Jeff Dean is the only man on Earth that is allowed to wear that TShirt! Eventually what happened is Dean and Ng made pursuing building a massive neural net system, informally known as “The Google Brain” and based within Google X. The team started experimenting with unsupervised learning because there’s more unsupervised data in the world than supervised. This resulted in a massive milestone in machine learning and AI. Picking up on the most commonly occurring images featured on YouTube, the system achieved 81.7% accuracy in detecting human faces, 76.7% accuracy when identifying human body parts and 74.8% accuracy when identifying cats. These results reveal that it’s possible to train a face detector without having to label images as containing a face or not. These findings are useful in the development of speech and image recognition software, including translation services. It’s the process of learning through repetition. So instead of having teams of researchers trying to find out how to find edges, you instead throw a ton of data at the algorithm and you let the data speak and have software learn from the data. 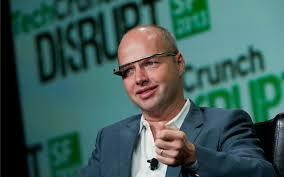 Google considers it such an advance that the research has made the leap from the X lab into it’s main labs. Rather than learning from tagged or labeled data in speech recognition for example, by soaking up massive amounts of transcripted speech data using tens of thousands of hours of audio together with the transcript of what was actually said to train neural networks to make predictions, it’s now massively less expensive to use unsupervised learning (learning from unlabeled data.) 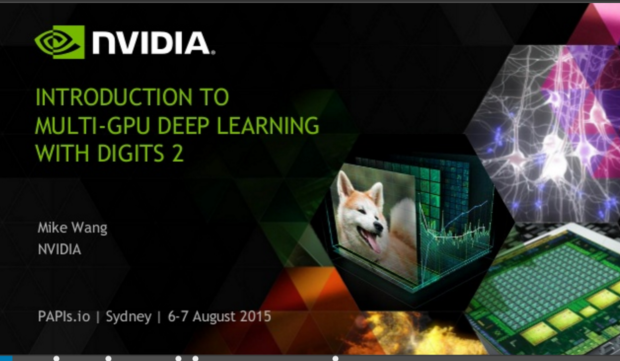 This is what’s driving most of the economic value of deep learning today. 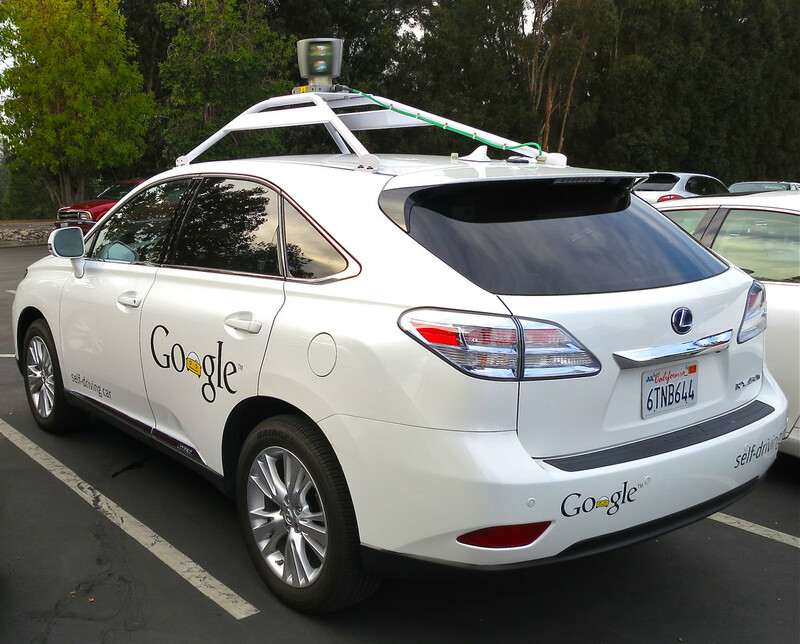 Ng has since left Google to oversee a new artificial-intelligence research lab in Silicon Valley for “China’s Google“, Baidu. The scientists said to find “a group of young people playing a game of Frisbee“, “a person riding a motorcycle on a dirt road“, and “a herd of elephants walking across a dry grass field“. The system “learned” on its own the concepts of Frisbee, road, and herd of elephants; very impressive! Given that Hinton’s hiring and Dean’s brain were major steps in pushing the company towards deep learning, perhaps the biggest move occurred in 2013, when Google spent $400 million to acquire DeepMind, an AI company. 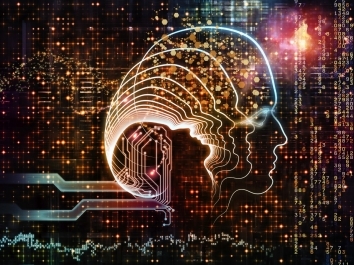 DeepMind has its own take on deep learning, based on a closer study of the brain itself. DeepMind’s CEO is another one of deep learning’s leaders, Demis Hassabis. At 14, Hassabis was an avid computer game programmer as well as a chess prodigy. 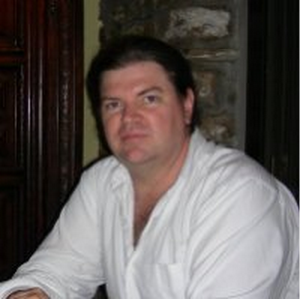 He had key roles in landmark game titles such as “Black and White” and “Theme Park“. 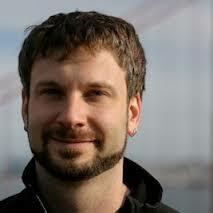 Then he started his own game company, eventually employing 60 people, while still in his twenties. But gaming, he says, was a means to an end, the end being the development of an intelligent general purpose artificial intelligence machine. By 2004, he felt that he had taken gaming AI as far as he could in that field. But it was too soon to start an AI company — the computer power he needed wasn’t cheap and plentiful enough. So he studied for a doctorate in cognitive neuroscience at the University College London. 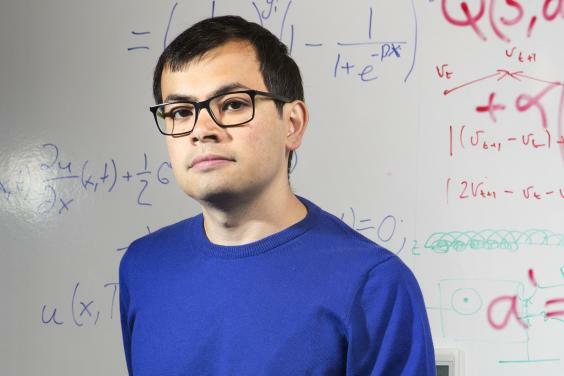 Hassabis has some ideas how DeepMind technology might enhance people’s lives. A more proactive version of search – not only finding things for people but making decisions for them – would be a valuable provider to save time. For example, there’s more books in the world than anyone could read in their lifetime. If you’re on a flight or relaxing, you shouldn’t have to think about what book to read; it should be automated. He also envisions using DeepMind in Google’s self-driving car or Google’s new company Calico, focused on health and well-being. To many, this sounds scary, even to Hassabis. 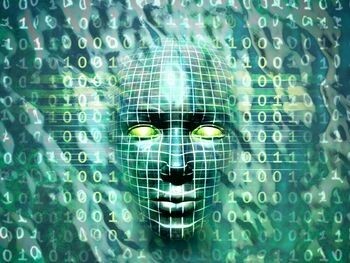 He acknowledges that the advanced techniques his own group is pioneering may lead to a problem where AI gets out of human control, or at least becomes so powerful that its uses might be best constrained (DeepMind investor Elon Musk – of SpaceX, PayPal, Tesla Motors, Hyperloop and SolarCity – just invested $10 million to study AI dangers). That’s why, as a condition of the DeepMind purchase, Hassabis and his co-founders demanded Google set up an outside board of advisers to monitor the progress of the company’s AI efforts. DeepMind recently published another major paper, describing a project that synthesizes some ideas from neuroscience memory techniques to create a neural network with the properties of a Turing Machine, which is synonymous for a universal computing device. This means that this system, given enough time and memory, can in theory compute anything. 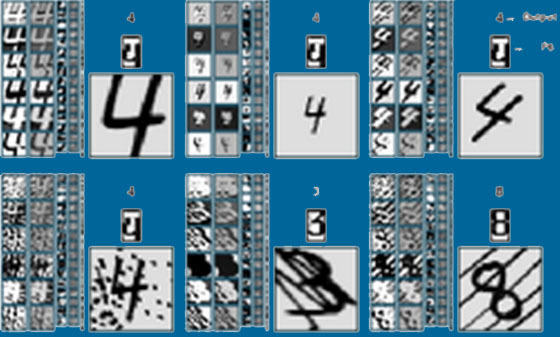 The paper focused on the practical: with the ability to “record” information and draw on it later – a type of artificial version of a person’s working memory – the “Neural Turing Machine” was not only able to learn faster and to perform more complex tasks that previous neural nets, but “to generalize well outside its training regime“. 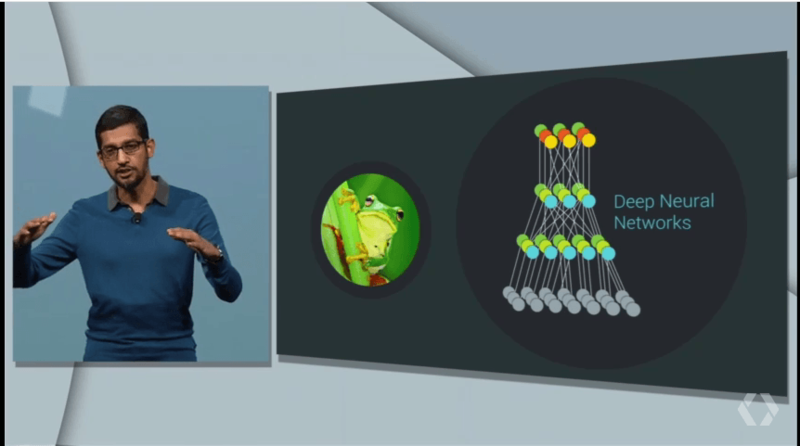 Since Jeff Dean’s deep learning project has moved from Google X to the Knowledge division (which includes search), his team has been working closely with many search-related teams, including language, image recognition, ads, street view and self-driving cars. Dean’s neural model for end-to-end language translation is superior in picking up nuances in diction that are key to conveying meaning. And their speech recognition technology has only an 8% word error rate. Microsoft has launched its InnerEye computing program, which is aimed at analyzing medical images and identifying disease progression. There’s a lot of good being done with the advancement of AI. LeCun’s group at Facebook has created software that matches faces almost as well as you do. For example, they’re envisioning AI that keeps you from uploading embarrassing pictures of yourself! 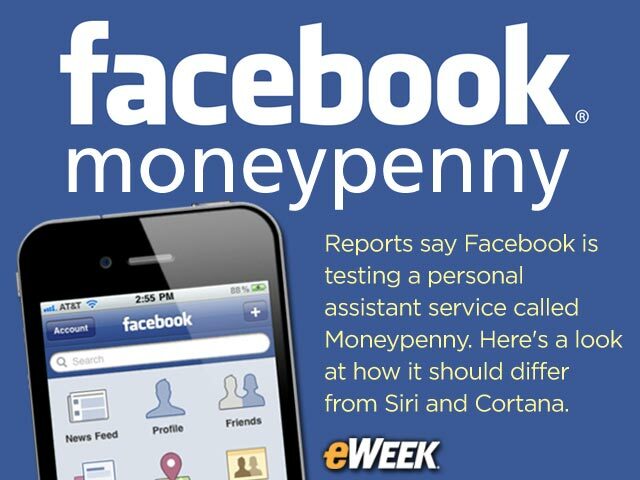 And they’ve also created a virtual assistant named Moneypenny. Click here to see how it differs from Siri and Cortana. Now to tie this all in with augmented reality, Microsoft’s Cortana combined with Hololens appears in your Windows car as a virtual assistant, projected right onto your windshield! Google’s Always Up To Something New! Other companies charge to use their machine learning tools and the code behind it is hidden; therefore, it can’t be expanded upon by others unless you’re on the team in that company’s machine learning division. 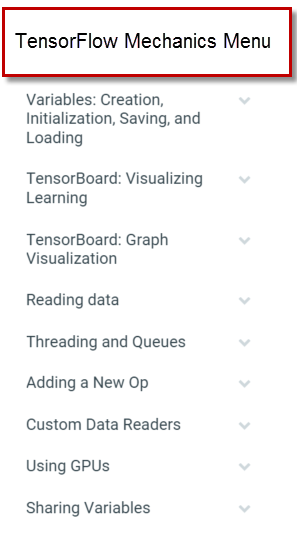 Google, on the other hand, is being true to science: they benevolently made their advanced machine learning FREE for everyone. Their noble philosophy behind doing this goes back to the root of scientific discovery and the invention of the internet itself: research communication and collaboration. That is very impressive to me, indeed. 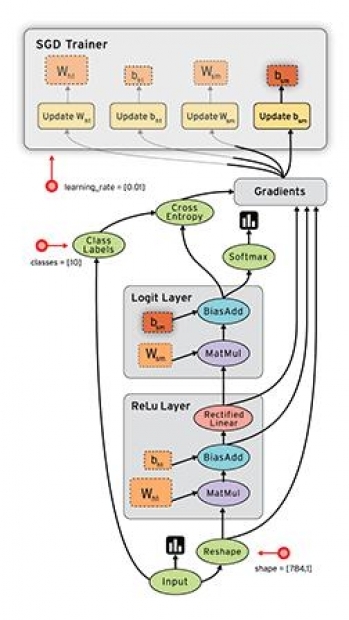 TensorFlow is loosely built on how the brain works, using “large scale unsupervised learning“. It can run on a single smartphone or across thousands of computers in data centers. 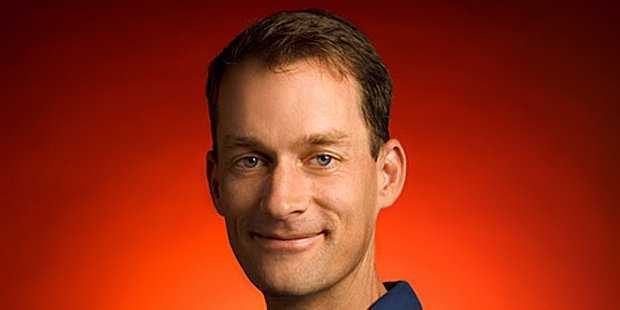 Jeff Dean and his researchers have used TensorFlow with over 50 different teams at Google, deploying this system in real products across a wide spectrum of areas. It’s used in Google’s speech recognition, their new photo app “Google Photos“, and in “Smart Reply” for Gmail’s inbox. It excels at perceptual and language understanding tasks, so the computer can actually see what’s in an image or a short video clip when you’re looking at it. You can download the whitepaper here, read about the technology on Stack Overflow here, and even fork your own repository from Google’s original source code on GitHub here! 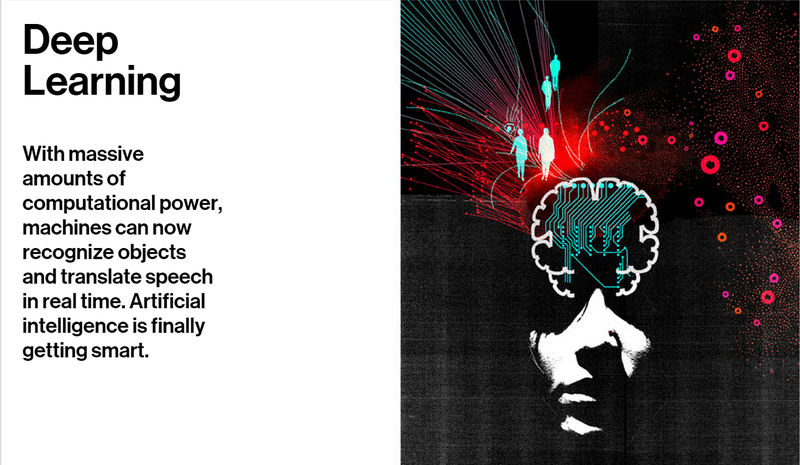 Google keeps feeding our brains! Thank you, Google! Exponential advances will allow deep learning to handle significant intellectual activities within 5 years. Health, the law and education are just a few of the vast array of human enterprises that will benefit. – DeepMind’s Neural Turing Machine learns to play video games by playing each game many times. Some 80% of employment opportunities in developed economies will be affected by software systems based on deep learning principals leading to social disruption if governments don’t plan the re-shaping of economies as change occurs. Eventually these developments will lead to significant productivity benefits delivering reduced working hours and an improved quality of life. Find out why deep learning leader like Jeff Dean Google senior fellow, John Platt of Microsoft Research, Google Scholar Adam Berenzweig from Clarifai, Elliot Turner Founder of AlchemyAPI and Ilya Sutskever working on Google Brain are impassioned about this breakthrough field. Did you post my article? A Japanese online technical media company translated this & published it at my permission. I’d love to see it!